Niccolò Salvi, winner of a 1732 design competition, took thirty years to build this late Baroque fountain which spans a short city block and features a central figure of Neptune (Poseidon) is flanked by two tritons, each symbolizing the contrasting moods of the sea. Its water, from Acqua Vergine, was considered Rome's softest and best-tasting; for centuries, barrels of it were taken every week to the Vatican. The water was declared non-potable in 1961, and is now recycled by electric pumps. 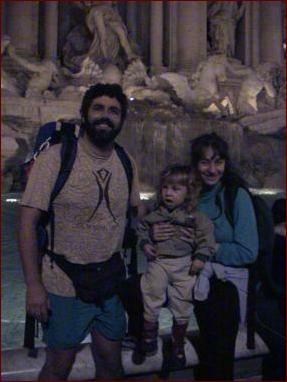 The fountain site was originally the terminal of the Aqueduct built in 19 B.C. 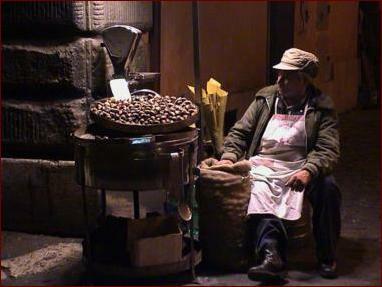 All around the city we see vendors of roasted chestnuts, but the most picturesque setup was here.